Everything that you do in life – business, family, church, and anything else you can imagine – all begins and ends with relationships. 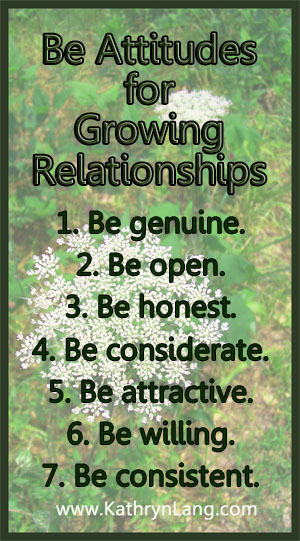 Relationships are the foundation that grow the opportunities to produce the fruit. Relationships provide the fuel (motivation and inspiration) to keep the momentum going. Relationships offer the support and comfort for getting through what has to be gone through. Everyone – or at least everyone I have talked with – is looking for that formula; a magic key that will open the door to their success. I have searched high and low for my own key, but it turns out I had it all along. 1. Be genuine. Nothing turns off a person faster than pretend. We want imagination, but only in our fiction. In real life, be real. 2. Be open. I was asked once about how much I was willing to reveal when I write. “I write naked.” Exposed writing (and living), where I reveal my heart, my hopes and my honest journey, will connect with others. 3. Be honest. You can tell people the truth or people will see the truth for themselves – but the truth has a way of making it to the surface. Go ahead and be honest about your own journey and you will find that it builds the foundation for a relationship that will last beyond a sale, a moment or an introduction. 4. Be considerate. As much as we all want it to be, it is not all about “I.” Think about others and putting others first are corner stones for building and maintaining strong relationships. 5. Be attractive . . . to your TARGET market. This requires understanding why I am doing, what I am doing, how I am doing it and for whom it is being done. I have to know who I am connecting with in order to be able to connect with them. I am attractive by being my unique me. 6. Be willing. It takes effort to make connections and even more investment to nurture and grow those connections into relationships. Be willing to reach out to others. Be willing to be available for others. Be willing to invest in the connections and opportunities. Put it to work. 7. Be consistent. We all want dependability. Know what you are doing and why you are doing it and then do it – on a consistent basis. Building relationships is not rocket science. It is not a complicated mathematical or scientific equation. Relationships are simple. All you have to do is give who you are with an open heart. Simple – but not always so easy. Before others will invest in my journey, they have to believe in me. They come to believe in me when I value them, reveal my own heart and give them value without expectation of return. Are you willing to give? Kathryn, I love your relationship-building steps, especially because I see you practice them up close. Thanks for a great post! Thank you so much Wade – for all that you do for the writing and blogging community and for the encouragement you are in my own journey! Oh – and a big, special, super thank you for the wonderful Yall Connect conference you invest in each June.